He passed away without sending to me both newspaper articles he mentioned in his story about Floyd Mullin. Maybe his son Rick will send to me both newspaper articles before he dies some day into the future. Especially knowing I have tripled the reward money to the first person who sends to me that second 1970 newspaper article. It's now $900. I feel like I should be the host of a game show like the "Wheel of Fortune" or ""let's Make a Deal." --he will chase you down in the dark! On October 22, 1998, Dr. Glen Cole was a keynote speaker for the Sacramento Class Convention, which was held in Roseville, CA. Mr. Cole's message for the first evening class was titled "One Life Making The Difference." Cole started his message by sharing how wonderful and generous the Norwegians of Minnesota are. He went on to tell how these Norwegians had given him an all paid traveling gift to go to Norway. Cole then focused his attention on giving his message, which he used the scriptures from the book of 1Samuel, chapter 9, verse 6. Cole spent some time telling how one life in Sacramento can make the difference. He also spent some time in telling how important it is, for those who are in the ministry, to be upstanding people. People who can walk the talk. People who can be trusted and people who aren't phonies. Honorable people. Cole then told a story about an experience he had in the State of Washington, right after an evening church meeting, where a woman had been assaulted and also had her purse snatched from her by an unknown person. Cole then tells his story about how he and his 6'5" (275lb) friend were able to chase this purse snatcher down in the dark and flush him out of some bushes. 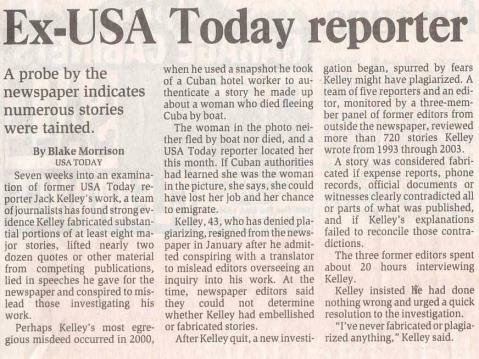 Cole tells how this story made the newspaper twice-once on the front page of the newspaper. The purse snatchers name was Floyd Mullin. After Cole was finished with giving his message, he was approached at the front of the auditorium by a man (also a Norwegian-which was me) who had just finished listening to him. I told Cole that I too was a Norwegian and I also had a gift for him. I told Cole that his entire message was inside the gift. Cole smiled and thanked me for the gift. I asked Cole not to open the gift until he got home later that evening.......................do you think Cole waited until he got home to open the gift? 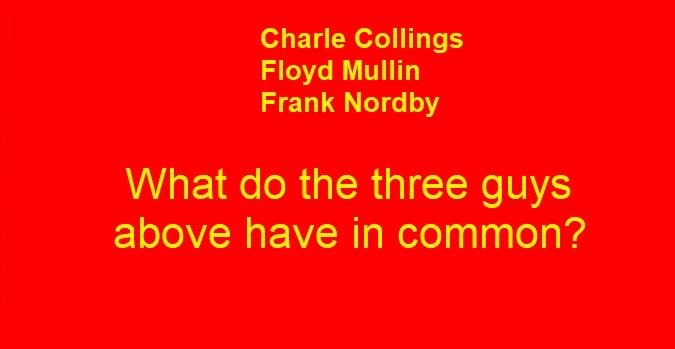 The next day, October 23, at another convention (class #2,) Cole was approached by a grandson of Charles Nordby, who wasn't aware of the gift that Cole had received the night before from a son of Nordby, and asked Cole what he thought about the situation between Charles Nordby and Raley's? 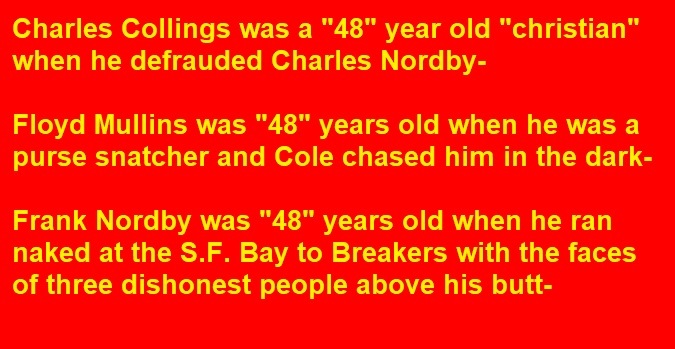 Cole angrily told Nordby's grandson that Charles Nordby was a liar, a slanderer, and doomed Nordby and his family to hell. 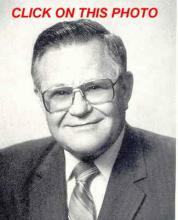 Before Nordby passed away in 1996, he accepted Jesus Christ as his personal saviour. This reporter above also resigned her position at the Sacramento Bee for fabricating her stories. Although it doesn't surprise me that reporters at the Bee are being unethical. Several Northern California pastors, including Sacramento's Assemblies of God leader Glen Cole, are among hundreds of evangelical Christians who have been bilked out of $160 million in a brazen Ponzi scheme, federal authorities said. 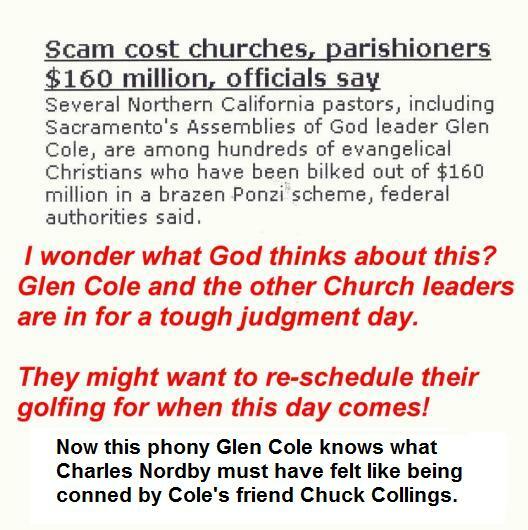 The organization of 440 churches that Cole leads, the Assemblies of God District Council of Northern California and Nevada, lost $3.5 million in the scheme, an SEC official said Friday. Earlier this week, federal agents arrested the alleged mastermind, Gregory Earl Setser of San Bernardino County, along with his wife, Cynthia, his sister Deborah Setser and his daughter-in-law Charnelle Setser. All were officers of Setser's Ontario-based firm, International Product Investment Corp. (IPIC), and all were charged with securities fraud and money laundering. The firm, which allegedly defrauded at least 29 Christian churches and ministries nationwide, claimed to have bought billions of dollars' worth of toys, bottled water, and other items made in foreign countries, and then sold them to Costco, Pier One Imports and other giant retailers, according to the Securities and Exchange Commission. The SEC said the company falsely claimed far-flung enterprises that included real estate speculation, oil exploration, the treatment of infectious diseases, the sale of condoms, and even a diamond mine in the Republic of Congo that it operated for President Bush and his family. Investors were promised returns of up to 50 percent within six months and were assured only one in 10,000 deals went bad, the SEC said. A Ponzi scheme uses money from later investors to pay artificially high returns to early investors, thus attracting even more investment. Setser, a self-described former minister, told potential investors he didn't need their money, "but, as a man of God, he wants to serve God by allowing Christian ministries to share in IPIC's profits," the SEC said in a civil complaint filed in federal court in Dallas. Setser, 47, originally opened IPIC Investments in Canton, Texas, but in May 1993 pleaded no contest to charges of theft by check and seven months later declared bankruptcy, the SEC said. Investors were told they were blessed to be involved with IPIC and its real estate subsidiary, Home Recovery Network, but, "In truth, IPIC and HRN are not in the import-export or real estate business or engaged in any other legitimate activity," the SEC alleged. "They are operating a massive Ponzi scheme. ... Gregory Setser, a self-styled former minister and apostle of the Christian faith, is robbing Peter to pay Paul ? but only after taking a massive cut for himself, his family and his affiliates." The SEC has accused the Setsers of transferring millions of dollars into offshore accounts and buying themselves homes, a $2.3 million yacht and a helicopter. Attorneys for the Setsers did not return phone calls Friday. Neither did IPIC's headquarters. The Setsers are in federal custody pending a ruling on a bail request. If convicted, each could face 45 years in prison and millions of dollars in fines and restitution. The scheme, which began in mid-2000, has taken in at least $160 million from as many as 29 churches and hundreds of individual investors, said Spencer Barash, head of enforcement for the SEC's Fort Worth, Texas, office. Barasch said the victims included several California churches. The Assemblies of God District Council of Northern California and Nevada invested $7 million, Barasch said. "They got about $3.5 million back in Ponzi payments from later investors." Juleen Turnage, director of public relations for the Assemblies of God national headquarters in Springfield, Mo., said in a statement: "We know nothing about this matter. It's strictly a district matter, and you'd have to speak with Glen Cole at the California district office." 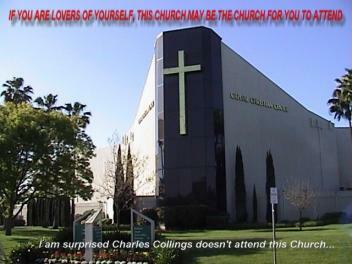 Cole, superintendent for the church's Northern California and Nevada district, admitted he'd been taken. "I'm afraid so," he said. "I think he (Setser) was at one time an evangelist, a Christian minister." Cole's Sacramento-based organization serves as the business office for 440 Assemblies of God churches with nearly 125,000 members. "The people that have invested have been notified," said Cole's secretary. "The one thing we don't want is panic." One retired Sacramento pastor said he invested $20,000 in IPIC two months ago. The pastor, who asked to remain anonymous because he was embarrassed he'd been "ripped off," said he was at a meeting of the district's pastors when IPIC came up. "I know Glen Cole thought he had really looked it through and it was very legitimate," said the pastor. "It sounded like they were actually buying products and shipping them. I was told (by an IPIC representative) there was a 100 percent markup and you would get 50 percent and the company would get 50 percent." The pastor said he was told he would start seeing the money within 90 days. "The Bible teaches that God delights in the prosperity of his servants, but it also teaches us not to love wealth, and it certainly teaches against greed," he said. So-called "affinity schemes" targeting religious groups "have happened before," he said. "You'd think we would learn." Rick Cole, who in 1995 succeeded his father, Glen Cole, as pastor of the 4,000-member Capital Christian Center of Sacramento, said his church turned down a pitch from IPIC two years ago. "They gave us information about other nationally known ministries that were participating," he said, adding that church representatives visited IPIC's warehouses in Southern California. "It appeared to be a good risk to take." According to the SEC, Setser told investors that IPIC's fortunes took off after he bought $67,500 worth of glassware from Mexico in 1996 and sold it for $800,000 a year later. The SEC said IPIC claims annual revenues in excess of $700 million and more than 100 employees in Panama, China, Germany, Israel, the Philippines and eight other countries. But when a client sent an attorney to Panama to check out IPIC's advertised coffee plantation, Setser showed him some land that IPIC "was planning to use for a coffee plantation," the SEC said. In addition to encouraging investors to reinvest their profits, "on at least one occasion, an IPIC representative told an investor that the Patriot Act hindered IPIC's removal of funds from Panama," the SEC said. Last month, IPIC announced plans to go public on Nasdaq and offered investors the chance to turn their original investment into shares that would at least double in value during the initial public offering, the SEC said. Investors who tried to cash out were told they couldn't collect while the company was going public, the SEC said. The SEC expects to recover much of the missing millions, Barasch said. "We got to this scheme pretty early and we were able to do it without tipping off the Setsers," he said. "We have frozen all their assets, we've taken over their offices, and we're chasing down where they might have moved the money." Gregory Setser came across as a back-slapping, glad-handing good ol' boy who had hit upon a terrific way to make money and wanted to share his blessings with his Christian brethren nationwide. 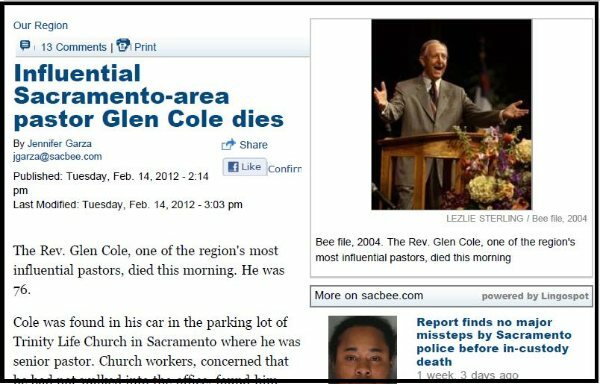 Sacramento Assemblies of God leader Glen Cole said Setser's affable, born-again persona and connections to renowned evangelists persuaded him to invest millions of dollars in church funds in Setser's purported import-export business, International Products Investment Corp. (IPIC), which promised returns of as much as 50 percent within six months. Last month, federal agents charged Setser, a self-anointed evangelist from San Bernardino County, with masterminding a Ponzi scheme that fleeced at least 29 churches and hundreds of ministers nationwide out of $160 million. The alleged victims include the Assemblies of God District Council of Northern California and Nevada, which serves as the business agent for 435 churches and 1,500 ministers. Cole, the district's superintendent, said the group invested in IPIC in an attempt to recoup $3.5 million needed to pay members' medical bills after the district's self-insurance plan went belly up. About 180 individual investors ? among them Cole, who says he lost $111,000 ? invested millions more in the venture before the Nov. 18 arrests of Setser; his wife, Cynthia; his sister Deborah Setser; and his daughter-in-law Charnelle Setser. Setser, who was denied bail, has invoked his Fifth Amendment right against self-incrimination in a deposition with Securities and Exchange Commission officials, who have frozen IPIC's assets and are searching for offshore accounts. The defendants are to be arraigned in Texas next month on charges of securities fraud and money laundering; none has admitted wrongdoing. Setser's Ontario-based firm claimed to have bought billions of dollars' worth of toys, bottled water, motor scooters and other items made in foreign countries, according to SEC officials. They said he would tell investors he could sell the products to Costco, Pier One Imports and other giant retailers at a 100 percent markup ? and offered to let them in on the front end, with the promise they would split the profits 50-50. SEC officials say the company falsely claimed $700 million in annual revenues on far-flung enterprises that purportedly included real estate speculation, oil exploration, the treatment of infectious diseases, the sale of condoms and even a diamond mine in the Republic of Congo that it operated for President Bush and his family. "To say they did no business would perhaps not be accurate, but certainly nothing anywhere near the scale they've claimed," said one federal source. Cole's district invested in the venture using money the members pay in monthly tithes and ended up losing nearly half a million dollars. Now, some pastors are calling for the resignation of Cole and his lieutenants, Assistant Superintendent James Braddy and Secretary Treasurer Rich Hopping. An anonymous newsletter and related Web site, "Nor-Cal/Nev Exposed," have appeared. The site includes postings from pastors defending the leadership. But the newsletter called for a full accounting and declared, "The Executives and Presbyters (the 33 ministers on the district's board) that approved this unwise, foolish, imprudent, ill-advised, injudicious, reckless, and irresponsible decision must personally be held accountable." Cole, Braddy and Hopping said they were motivated by a genuine desire to solve the district's financial problems. "These people who are writing nasty notes ? it's not Christian, it's cowardly, it's wrong," Cole said. "I would classify it as a downright sin." Cole, in a recent letter to his membership, said: "We are tremendously humbled and repentant. ... The IPIC program began with seeming integrity and production, providing real dollars to pay down the (unpaid) health insurance claims. ... We are still not sure what has gone wrong." He promised to answer all questions at an emergency meeting to be held at 1 p.m. Monday at Sacramento's Capital Christian Center. In an interview with The Bee, Cole, Hopping and Braddy said the district bylaws require them to provide health insurance for members, many of whom are elderly or infirm and have a tough time getting insurance. "After the 9/11 debacle, insurance rates just went crazy," Cole said. "We have over 1,000 ministers in need of health insurance." Cole said they struck a deal with a Sacramento-based insurer that said "there was no risk, because they had a stop-loss insurance policy. 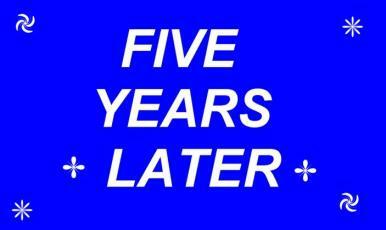 We were into it for a few months when we realized claims exceeded premiums. The insurers' stop-loss carrier went bankrupt, and over three years, those (unpaid) claims exceeded $3 million above the premiums." Members were being forced to pay claims out of their own pockets, Hopping said, when the district's accountant, Jerry Hannay, learned of IPIC from Tom Henschke, a pastor with a Florida ministry. In an interview, Hannay said he received a fax from Henschke avowing: "I have known Greg Setser for over 20 years. A good man of great business integrity and a desire to serve the Lord in any way possible." Hannay said he told Cole and Hopping, "You can smell out a rat quicker than I can," and arranged a meeting with Setser in August. "When he left, we were all pleased with what we heard and saw." Hopping described Setser as a ruddy-faced blond, about 5-foot-10. "He's just a good ol' boy, he's an ex-preacher and he talks the talk real well," Hopping said. "He didn't seem real sophisticated, not a wheeler-dealer ... but he apparently had come across something that was working." Cole added that he called one of Setser's references, well-known evangelist Ralph Wilkerson of the Melodyland ministry in Anaheim. "He thinks Setser is a wonderful guy," Cole said. To test the program, three district members invested $75,000 in a contract for Mexican candleholders in May 2001, Cole said. The investors reaped a 30 percent profit in 90 days, he said. In early 2002, Hopping flew to Setser's Ontario headquarters. "It seemed like a regular office operation," Hopping said. "He was real proud of a new computer they were using to track worldwide product." Hopping said Setser took him to a warehouse filled with thousands of boxes. "He cut into one filled with prophylactics and asked me if I wanted to take some with me," said Hopping. "We never invested in that." Over the next two years, the district and various individual investors bought 40 IPIC contracts for teddy bears, paint, paper, lemon juice, cut glass and a toy doctor set, Hannay said. He said 32 contracts were completed, "which means we got our money back." At the district's annual meeting last April, Cole announced the district had collected $2,334,621 on a $1,390,000 investment, "and we were paying health claims." This was the first time many ministers had heard of IPIC. While some members questioned the investments, others wanted in, said Hannay. He said he ultimately signed up 180 individual investors, mostly ministers, church members and their relatives. "I said, 'I'm involved in it personally because I want to be able to give more to charity,' " said Hannay. "I specified there are no guarantees -- if this thing goes down, there's nobody we can run to to get our money from." He said he never publicized the program, but when people heard about it, "It was almost like a tidal wave." But by July, the payments stopped rolling in. 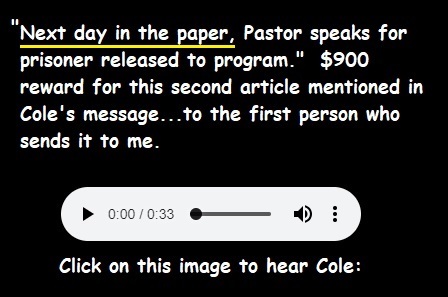 The ever-upbeat Setser appeared before the district board in a suit and open-collared shirt, "gave his personal testimony of his conversion to Christ," said the money was coming and repeated his dream of funding ministries worldwide, Cole said. On Nov. 12, Hopping said he flew to Ontario, where he saw a brand-new motor scooter in the lobby -- supposedly IPIC's latest product. Hopping said Setser told them IPIC was going public and that they would have $1.2 million by that Tuesday -- the day Setser was arrested. Cole said the district had invested $3.4 million, "and we've got back all but $448,000." But the 180 individual investors -- whose money was used to pay earlier investors, according to the SEC -- lost at least $7.5 million, Hannay said. "I'm down $151,000," he said. "It's something that caught me totally by surprise." Robert L. Stephens, a pastor from Paradise, said he's pastored Setser's mother -- IPIC's corporate secretary -- and a sister who's not involved in the business. "They're good workers, upstanding citizens, lovely people in every way," Stephens said, adding that Setser's mother told him "if they unfroze the assets, she could write everybody a check for their investment. She thinks it's all a big mistake." Cole said Setser's representatives have told him $45 million worth of motor scooters are sitting on a dock in Long Beach. "There is still a lot of hope that there will be repayment," he said. He promised to pay members' medical bills, even if he has to take out a second mortgage on the district's $5 million Sacramento headquarters. Federal agents searching Setser's Rancho Cucamonga home found a copy of the book "How to Be Invisible" and a printout on "The Complete Guide to Off-Shore Money Havens," which, Cole admitted, "is somewhat incriminating." Click on the opening document to the left to view two letters Rick Cole wrote to a son of Charles Nordby.